My grandparents also used to preserve a lot of peppers such as vinegar peppers, cherry-hot peppers, and small tomato peppers. They would use the preserve to make pickled eggplant. My dad and I used to go down to the farmers market Down Neck. Farmers would drive in from around the state and sell their wares. A lot of the people with vegetable stores and fruit stands would go there and buy produce for resale the next day. The farmers would come in early, about 11:00 p.m. or midnight, and they would have to stay until 11:00 in the morning if they didn't sell their wares. As soon as a farmer sold his wares, he would head back home. 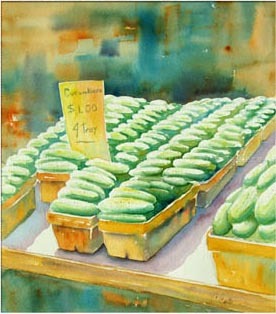 Sometimes they would sell out in half an hour or less because a big fruit store would come in and bid on a whole truckload of produce, like lettuce. If the farmer was willing to accept the bid, he would close up shop and go home. But farming is a rough job. They had to pack that produce up at the farm, load it on a truck, then drive 40 or 50 miles to the market, wait until it was sold, and then drive back home. Sometimes they made a good profit, sometimes they just about broke even. The farmers' market was a nice experience for me because it was something new and exciting. I got to get up at midnight and go to the market with my dad. We used to take a bus down to the end of the line, then walk about a quarter of a mile to the market. The market was situated in an area about the size of a large city block. The farmers would back their trucks up to walkways, which were eight or nine feet wide. The trucks were parked side by side, close to one another with no wasted space between them, and each farmer sold his own wares off the back of the truck. Each farmer paid a rental fee for his location, and this was his permanent spot and no one else could use it. Each night an inspector would come by and collect the rental fee. If a farmer was not there, the city would rent the space to someone else so as not to lose any revenue. The system seemed fair to all. I remember it distinctly. It was a good feeling walking in the aisles in the early morning amongst all the farmers and hearing them barking their wares and hollering what they had for sale. If a large purchase was made, the buyer would hand-truck the produce back to his own trucks, or hire so-called carriers to truck it for them. Any small buys they would handle themselves. There were always restaurants open there, hot dog stands, and sausage stands. You could buy a hoagie and pass the time away. Of course, in the winter all you would drink would be coffee. If you didn't drink coffee, I'd hardly think anyone would drink beer. But those people were drinking. They were drinking beer, and drinking liquor-- straight shots-- just to keep warm. They used to come to the market at midnight all bundled up, and they would jump up and down and wrap their arms around themselves to try to keep warm. The reason my dad went to the market was because we were a large family and we used to buy produce in larger quantities than most people would normally buy at a vegetable stand. We would buy three or four cases of whole tomatoes, a bushel of large green and red peppers, and a bushel of cherry peppers- hot ones. Then we would buy a dozen or so eggplants and, of course, whatever else we would need for the family like lettuces and celery. We'd have so much stuff to carry home that we would have to hire one of the drivers who waited for shoppers like us who couldn't carry all their purchases. They would put it in their little pick-up truck and take it home for you for a small fee. But it was worth it to us, because we would save money purchasing in large quantities, and it would have cost us a lot more had we bought the produce individually from a vegetable store.